Drainage of cerebrospinal fluid was studied in normal cats and experimental hydrocephalic cats. Hydrocephalus was induced by the injection of kaolin suspension into the cisterna magna. Artificial cerebrospinal fluid (MOS-4, Simizu) containing Sodium fluorescein (2%) and Evans blue (0.5%) was given by lateral-ventricle-to-lateral-ventricle of ventrículo cisternal perfusion. Fluid was pumped in at 0.123 ml/min and at a pressure of 3–5 cmH2O. The duration of the perfusion was 1 to 3 hours. In all animals, such tracers were observed around the ventricular wall. Sodium fluorescein seemed to pass into the cortex more quickly than Evans blue. In normal cats, sodium fluorescein and Evans blue were demonstrated in most of the cerebral cisterns and in the cranial subarachnoid space. They were also observed in the deep cervical lymph and lymph nodes. On the other hand, in acute hydrocephalus, there were few of such tracers in the cisterns, cranial subarachnoid space and cervical lymph nodes. In chronic hydrocephalic cats, however, they were demonstrated in the subarachnoid space around the spinal cord which passed through the dilated canal of the spinal cord. They were also observed in the optic nerve, nasal mucosa, deep cervical lymph and lymph nodes. They seemed to pass through the dilated olfactory ventricles into the nasal mucosa. 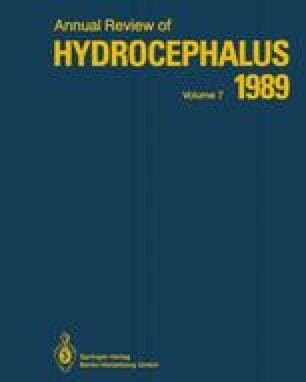 In this study, it was indicated that lymphatic pathways may play an important role in the resolution of CSF protein and large molecules in hydrocephalus.